Category Archives for "Interesting Links"
Sometimes the built-in components in the standard ArchiCAD library just aren’t flexible or smart enough for what you need. Over the years, I’ve told people about Objects Online, Cadimage and Cigraph as resources for additional objects and tools. However, recently I’ve become aware of the “next generation” — two young, smart and ambitious ArchiCAD users who have taken their passions for modeling and design into the area of GDL coding. ArchiCAD has a worldwide community of users, and these developers are no exception: Jeroen de Bruin is based in the Netherlands, and Kristian Bursell lives in Australia. Jeroen de Bruin has been working in several architectural agencies in the Netherlands. He joined the ArchiCAD distributor of Belgium and the Netherlands in 2006, responsible for Library Development. He started his company Master Script in 2009, to create GDL objects for architects world wide. The main focus of his objects is to improve the BIM factor of your design. His latest objects Total Zone and Total Marker do exactly this. While you feed information into your zone, doors and windows as your design grows, these objects will show this information any way you like. Thanks to the Model View Options you can store which information you want to show and how you want to show it. This can be saved in any view. So in one view you can show the name of a zone and in another the surface and occupancy and yet another the finishes. For more info, please check out Jared Banks’ review on Shoegnome. There is more to see on the Master Script website: check out his Object-Slicer (Floor Plan Cut Plane-sensitive and story-sensitive display of any object), Mesh Generator (create meshes like blobs, soft objects or free forms) and Label Everything (show any property for an ArchiCAD element). There is also some free stuff on his site, like an Eames Chair, Sea Container and 2 articles about custom object-making which appeared in the magazine ArchiMAG. Jeroen asked me to tell you – if your object or feature isn’t there, just email him. I would also like to introduce to you an innovative ArchiCAD library part creator, Kristian Bursell of CADSwift in Australia. Dubbed “a GDL guru” by one of Graphisoft’s most respected members of staff; Kristian is a dedicated GDL scripter who is pushing the boundaries. His tools focus on automating processes and bringing the joy back into modelling all building elements. Kristian’s Library Parts are smart, highly parametric GDL Objects. They are complete design and documentation tools covering most configurations for each specific building element. They also include intelligent annotation and representation features to automate as much documentation as possible. Kristian’s library is very affordable and includes some of the best ArchiCAD Objects available. You can view the library on his website which includes informative demo clips for each part. I also recommend that you subscribe to Kristian’s newsletter as he is continuously improving and adding to his library. Feel free to email Kristian if you have a question or would like a custom part designed. Originally developed as part of my Best Practices Course, the QuickStart Course is now available as a separate, low-cost product from our website. In 29 easy to follow video lessons totaling over 13 hours, the basics of ArchiCAD are explained and demonstrated. You can watch the first 6 lessons of the QuickStart Course – about 2 hours of videos – without signing up so you can get a good sense of the training style and approach. Go to the Course Outline in the member area to watch these video training lessons. Oh, and there’s one more free video lesson you can watch there: an introduction to terrain modeling (module 7 part 2) which is a 49 minute exposition on what I consider the simplest and easiest (yet also best practices) method for building up a site mesh from an imported DWG file. 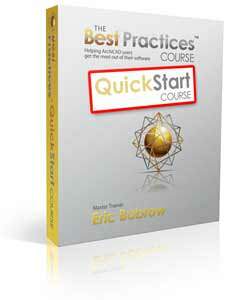 The QuickStart Course has an introductory offer good through October 31. Please check it out and/or recommend it to colleagues who may find it useful. 15,962 Fans for ArchiCAD on Facebook! I’ve been on the periphery of the whole social media revolution. Of course, I am a techie, and have created multiple websites and made lots of email broadcasts over the years, but until recently I hadn’t done much with Facebook or Twitter or even real blogging. Now my wife is another story. Each day she goes onto Facebook and interacts with lots of friends, watches videos, laughs a lot, shares some of her stories and gives encouragement to anything and anyone that brings beauty, truth and light to the world. It’s a major part of her routine. Occasionally I help her out – I’ve set up a few fan pages for her, and posted some events to promote her yoga and dance workshops. Our son is very conversant with all of this as well. He’s 21, in his third year at university, and of course he was brought up with this stuff. He’s too busy to spend that much time on it, but I’m sure it’s all second nature. I’ve been an avid student of internet marketing for the past year or two, and have learned so much. I’m adjusting my style to be more personal, to share my thoughts, to appear prominently as an individual in relation to my professional offerings – rather than hiding behind a company, even my own company. It feels incredibly comfortable, as I stop trying to pretend to be big (e.g. “We’d like to announce…”) and instead share myself – my gifts as a teacher, as an author, as an ArchiCAD expert, and as a caring indivdual. Which brings me to the title of my blog post. As of today there are now 15,962 individuals who “Like” ArchiCAD’s page on Facebook! How incredible! Not only are there lots of ArchiCAD users out there, these are people who proudly say “I like ArchiCAD”. They don’t need to fit in with the crowd who use Brand X, in fact they’re happy and passionate about their software tool of choice. What else does this say, beyond the fact that ArchiCAD has a substantial user base? It says that professionals are using Facebook, that it’s no longer just for the college kids and the people who aren’t busy working. It’s becoming THE place to network, with 500 million members and growing. Of course, LinkedIn and Plaxo and other social networks specifically focused on business and professional connections are growing too. 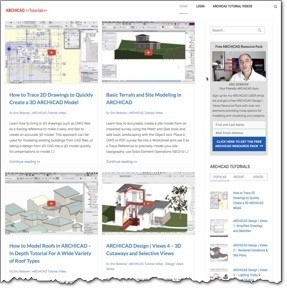 There is a thriving ArchiCAD group on LinkedIn – but it’s got 947 members – a substantial gathering, but nowhere near the number of ArchiCAD fans on Facebook. However, there is one thing that LinkedIn has that Facebook lacks (at this point) – a discussion board. There are many discussions in the ArchiCAD group, and lots of intelligent discourse. This plays a different role in the ArchiCAD community than ArchiCAD-Talk (also a VERY valuable resource), which tends to be more focused on technical questions rather than the more open-ended and personal discussions I see on LinkedIn. Another big surprise: recently I connected with a person who goes by the Facebook moniker archicadMonkey, a young man by the name of Apollo Spiliotis. He’s Greek by birth, although he was brought up partially in the U.S. and partly in the UK and he retains a bit of an American accent. He’s made a series of video podcasts on ArchiCAD and Artlantis that you can find on his website and on Youtube and Vimeo. He’s also made his own archicadMonkey App for the iPod, iPhone, iPad and now Android, that showcases his podcasts. What’s so surprising about this? Apollo told me that his videos have logged over 100,000 views on Youtube and 60,000 views on Vimeo. WOW! And it’s not like he’s made 100 videos each with 1,000 views – I counted a total of 17 so far. One of his videos has 37,792 views. So there’s a real audience for this stuff, after all! So where does this leave me? Now I’m becoming an avid student of social media, as well as internet marketing, video, website design, and of course…ArchiCAD. I’ve started blogging, Tweeting (@EricBobrow), Facebooking (Eric Bobrow) and posting my video tips on Youtube. I invite you to connect with me! One can never stop learning, or to put it in a positive way – one can always keep learning. And I’m hungry to learn more. Another world to explore! If you have created a great project showcasing sustainable design using ArchiCAD, please consider submitting a proposal to speak or be considered for an award. Let’s work together to have an ArchiCAD presentation at every show and multiple ArchiCAD-based projects in every competition! Graphisoft will work with users to help prepare and submit strong entries. The AIA Committee on the Environment (COTE) and its Top Ten Green Projects awards program recognize the benefits of sustainable design and acknowledge architects as leaders in the creation of environmentally responsible design solutions. COTE encourages architects and their teams to submit their projects for the Top Ten design competition. Now in its 14th year, the program is one of the best known sustainable design recognition programs in the nation. Winning projects will be recognized with an AIA COTE award certificate and acknowledged in the national press, on the AIA Web site, and at the AIA National Convention and Design Expo in June 2010. COTE Awards Submission are open, with a deadline of January 15.